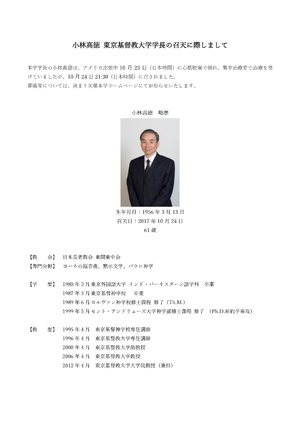 Dr. Takanori Kobayashi, President of Tokyo Christian University, has passed away at 9:30 p.m. on October 24th (Japan time). He had a heart attack during his US business trip on October 23rd (Japan time) and was hospitalized. He was scheduled to examine accreditation procedures as a chairperson of ATA (Asia Theological Association), and as the TCU president he also visited Biola University, one of TCU’s partner schools. Dr. Kobayashi suffered the attack in a taxi on his way to a church ministered by a TCU alumnus. He was taken to a hospital by ambulance with the help of TCU alumni attending the church, and received emergency treatment and intensive care. His family and a TCU faculty member flew to LA to meet him, but he had sudden changes in the condition and breathed his last before they arrived. Please remember his family in your prayers. The schedule of his funeral will be announced on TCU’s website later.